At Cookbook Of The Day i received a recommendation from "home before dark" to try the cookbook Earth to Table. Well it doesn't take much to get me to search out a new cookbook. I commented on the cover having many of my favorite things, including a pot pie. 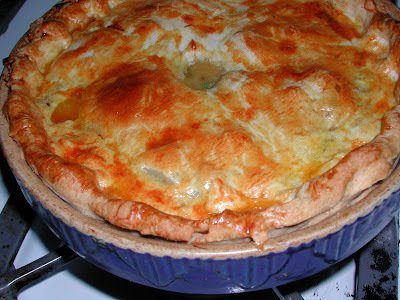 After writing that, I realized it had been a while since I made a pot pie, so I set out to resolve that issue. In the "crisper" and I use that term lightly, I found a stalk of celery, and two slightly limp carrots. In the freezer was half a bag of green peas. I always have eggs, so it looked like a chicken pot pie was doable. I turned the oven to 450F, salted the chicken thighs and stuck them in the oven. I chopped the onions, carrots and celery and sautéed them in a nob of butter. I peeled and chopped the potato and added it to the sauté pan. I drained the mushrooms, retaining the liquid, and chopped them and tossed them into the sauté pan. When the chicken was done, after about 20 minutes, I pulled it off the bone, saving the juices. In the chicken pan, I made a roux of flour and a bit of milk, thinning it with some of the mushroom juice and made a gravy which I poured over the vegetables and chicken and then I added the frozen peas. 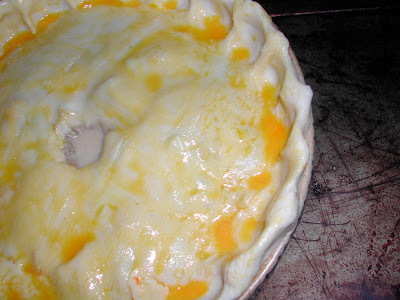 I put my crust in a deep baking bowl, added the creamed chicken mixture, and topped the pie with the second crust. I crimped, cut a hole for the steam and washed it in a beaten egg. Glad you are having fun with this! I made the darling bud pate and broke my cuisinart bowl trying to grind the pork belly! I also forgot to mark cloves and allspice I bought at the food coop for pumpkin pies and inadvertently used 1 1/2t CLOVES rather than allspice. I actually combined the darling bud with another country pate (had eggs, and cream in it. I added pistachios. I was trying to replicate a delicious pate we enjoy at a French restaurant in Kansas City. I took meat and cheese boards to three of my neighbors for Christmas Eve. All raved about the pate! A new tradition begins. Happy holidays. Couldn't be simpler! I used to labour with a whole chicken and my own pastry and make at least three pies. But I was staring at a marathon of work and rather gave up on the whole idea. I would rather make this than wait years for the enthusiasm to build again.